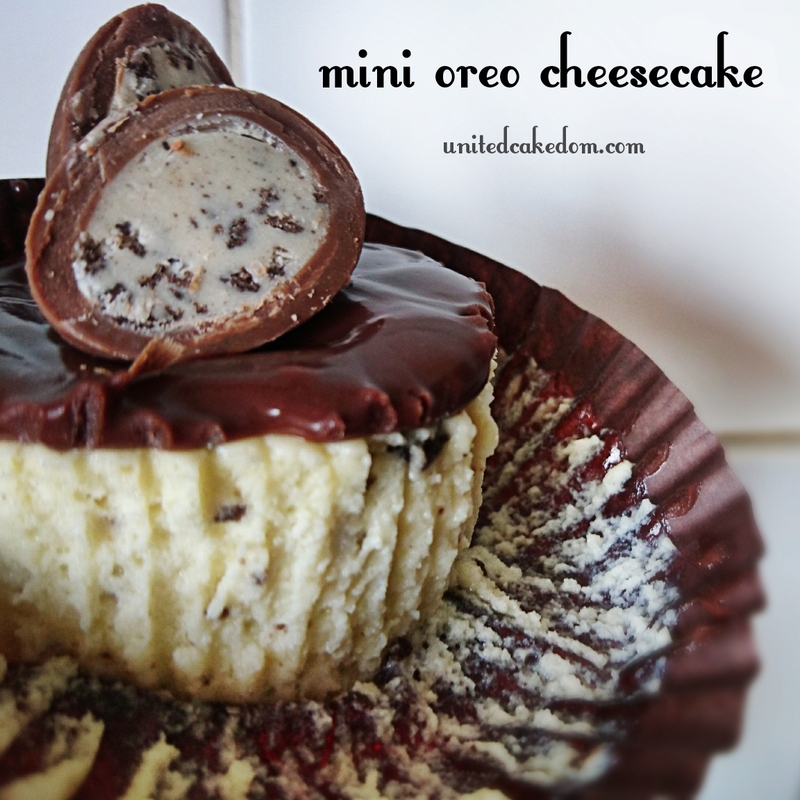 I have a very fuzzy memory of having mini cheesecakes like this when I was a kid. Maybe not Oreo's, but with a Vanilla Wafer or Nilla Wafers as the crust and a raspberry or strawberry topping. Either way when requested to have cheesecake for dessert I obliged. Cheesecake is great! But, and there is a but, it is super rich and sometimes a bit much to take on as a dessert. 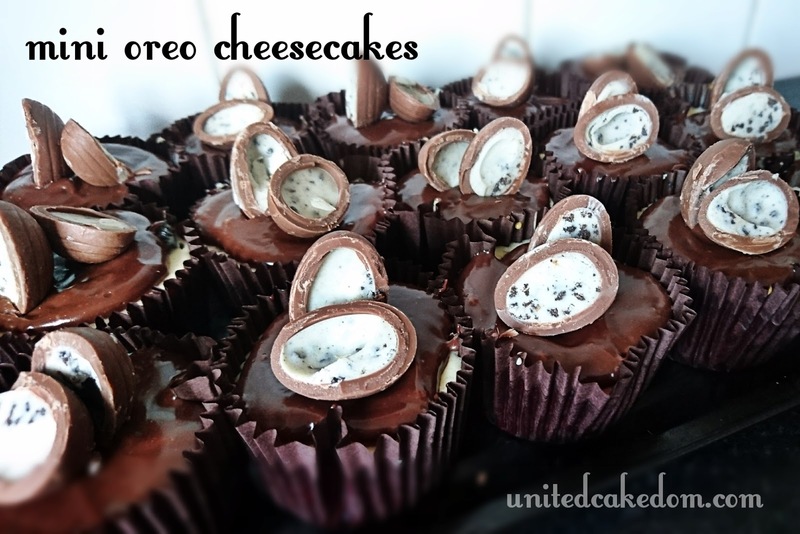 Therefore these "cupcake" cheesecakes are a great way to serve it without having to try and cut the perfect slice. Plus, one whole cookie acts as the base and saves loads of time and effort! Gotta love short cuts! Since Kraft have taken over Cadbury they have made Oreo Cadbury chocolate bars and at Easter we get Oreo Eggs - since it's that time of year I added these on top as a decoration! If it's not Easter add on a mini Oreo! Remember any sandwich cookie/biscuit would do as a base and the cheesecake flavors are endless! 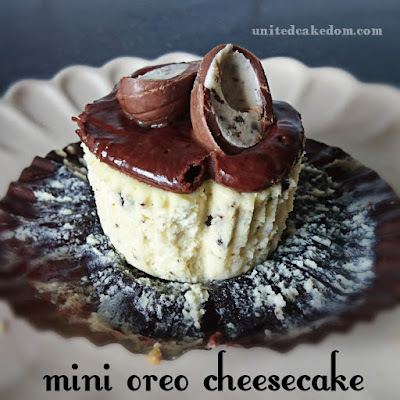 So, be creative and bake your favorite mini cheesecake, but to start this is how I made these! Heat the oven to 135C/275F and line a muffin tin with liners and place a whole cookie at the bottom of each liner. Beat the cream cheese until soft before gradually adding the sugar. Once combined add the vanilla and mix. Gently beat the eggs together in a bowl before gradually adding to the cream cheese mixture, scraping down the bowl as needed. Then add the sour cream and salt and beat. Chop up the remaining cookies, which should be 6 cookies, fold into the cream cheese mixture. Using a medium sized ice cream scoop fill the muffin liners with the cheesecake mixture. Bake for 22 minutes rotating the tins half way through baking. Filling will still be a bit wobbly, but should be slightly firm and colored on top. Leave to cool completely before placing in the fridge over night or for a minimum of 4 hours. In a double broiler melt the chocolate, stirring occasionally. When the chocolate is almost melted remove from the heat and slowly add the double cream mixing in quick small circles with a whisk, until the mixture comes together and is smooth and shiny. To Finish: Top the chilled cheesecakes with a tablespoon of the glaze and gently spread with the back of the spoon. 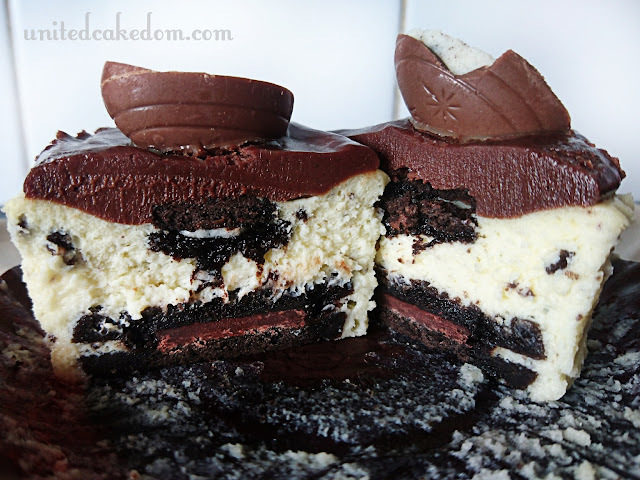 Top with chocolate eggs or cookie or nothing and serve! 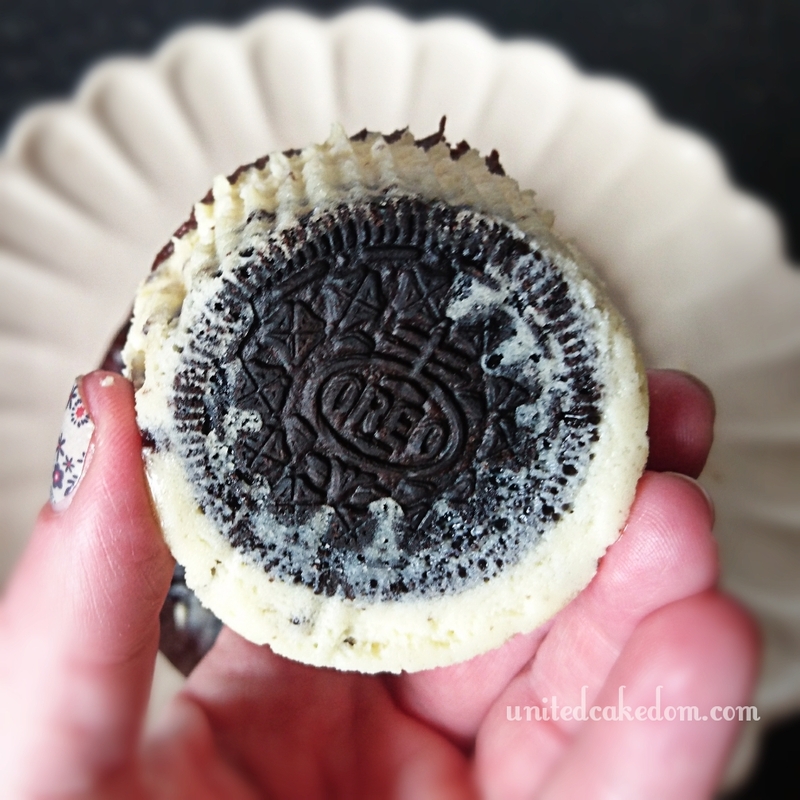 Cookies and Cream is not just an ice cream flavor! These mini cheesecakes are just the right portion size and the cookie gives a nice texture to the creamy cheesecake, great for dessert or afternoon treat! * This is NOT a sponsored post. All views and opinions are my own. Please see my contact/policy page above for more information. Recipe adapted from Martha Stewart.